← Can weather in the stratosphere affect us near the ground? The Antarctic Meteorological Research Center (AMRC) at the UW-Madison’s Space Science and Engineering Center (SSEC) maintains 57 Automated Weather Stations (AWS) in Antarctica. 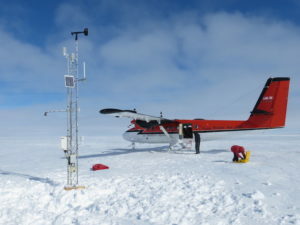 In the photo, Elina Valkonen and David Mikolajczyk travel by Twin Otter aircraft to service a remote weather station. The ice sheet is over 2 miles thick in places and in some places the ice sheet bottom is almost a mile below sea level. This massive ice covers mountain ranges, and volcanoes exist underneath the sheets. The Antarctic Ice Sheet is categorized as three ice sheets: the Antarctic Peninsula Ice Sheet, the West Antarctic Ice Sheet and the East Antarctic Ice Sheet. The Antarctic Ice Sheet currently discharges 90 percent of ice and sediment through corridors of fast-flowing ice within an ice sheet known as ice streams. Ice streams are typically large features, greater than 25 miles in width, and longer than 90 miles. Today, ice streams drain the Antarctic continent, with tributary glaciers reaching hundreds of miles inland. Overall, recent estimates indicate that over a 19-year survey, Antarctic’s net ice mass is decreasing. Satellite observations measured a widespread enhanced flow toward the ocean, with tributary glaciers reaching deep into Antarctica’s interior. Antarctica drains more than 80 percent of its ice sheet through floating ice shelves. In recent years we have seen the collapse and melting of these ice shelves. In 2002, satellite imagery captured the collapse of the entire 1,250-square-mile Larsen B Ice Shelf. The disintegration of this Antarctic Peninsula ice sheet was rapid. New observations indicate that glaciers in East Antarctic have begun to melt. Scientists have long considered these glaciers to be more stable than those in West Antarctica. Glaciers around the West Antarctic Ice Sheet are currently thinning. The Antarctic Peninsula Ice Sheet is changing most rapidly.